Located on the Red Road, Rt. 137 along the lower Puna coast, Kehena Beach (also known as Dolphin Beach) is a prominent landmark for both local residents and visitors. Its one of Hawaii’s Big Island “power spots” and for good reason as it is situated just down the coast from Kilauea and the lava flow of the Pu’u’O’o vent. The energy at Kehena Beach changes somewhat depending upon the crowd (or, the crowd is drawn there due to its fluctuating energy). The ocean activity at this beach is as energetic as the people who frequent it. Brilliant blue waves crash against black lava rock and a beach of black sand inclines down into the water line creating a strong undertow and, in my opinion, a strong electromagnetic field. The entire beach is enclosed by a 30 foot high rock cliff and surrounded on both sides by rocky peninsulas jutting into the ocean, creating a cove, encapsulating this energy. 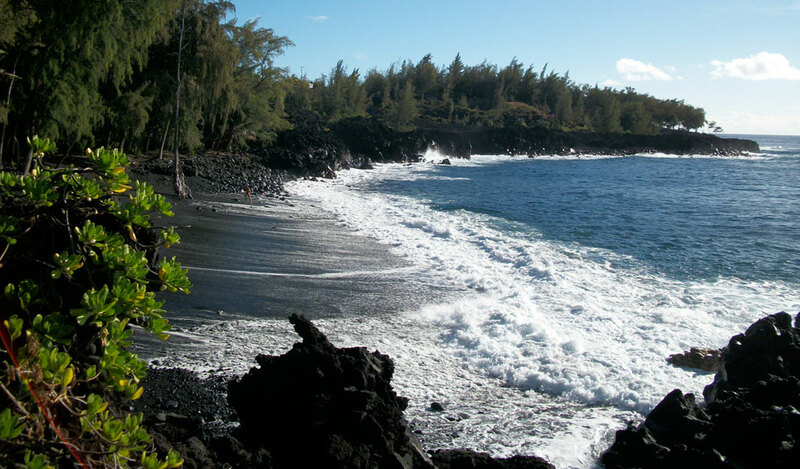 The beach itself is gorgeous with fine black sand amidst hosting several large rocks and boulders and a nice grove of ironwood trees. The hike down is NOT easy by any means but moderate on a scale of mild to difficult. A good sturdy pair of shoes is important as the trail descends through uneven rock. Near the bottom, round smooth rocks have sand on them making them deceivingly slippery, as well. Ultimately, Kehena Beach is not for the faint of heart. In addition to the steep descent into it and the strong ocean and powerful current, it is a clothing optional beach and most people take advantage of the option. There is not a sense of taboo in this respect. In fact, the seclusion of the beach itself and the attitude of its visitors make it seem quite natural. People from all over the world gravitate to the natural energy hotspot. Whether local or tourists, they are not there to ogle one another, and are simply there to gather and visit or to swim. There are no life guards at Kehena Beach and the waves are dangerous. Locals seem to have developed a technique for entering the ocean at the right pace, diving through the shoreline waves at just the right time to make it past the breakline which constantly changes. However, it’s possible to get pummeled in the wave breaks and rolled around like clothing in a washing machine. Dolphins often frequent the waters off Kehena Beach. One of my first experiences after moving to this area nearly three years ago was spotting the dolphins while driving along Red Road. We came upon a rise just above the beach and saw the dolphins playing off shore. A woman with a long scarf swam out to meet them. A dolphin took the scarf she handed to them and they swam with it and exchanged it between them. It was a most surreal experience. The morning crowd seems to be an older group. Some can be found doing tai chi or other forms of energy work. The morning sun is warm and welcoming and there is less chance to get burned. By 10am, the sun’s rays becomes hot and those who do not have a full body tan would be wise to cover up the parts that are not accustomed to being exposed to it. The mid to late afternoon crowd encompasses folks of all ages. Children build sand castles while young people play like water sprites along the shoreline. Middle aged people swim with a child-like playfulness and older folks sit and chat with one another and greet old friends. Some bring instruments and drum or play flutes. It’s an interesting mix of the eclectic and mainstream, all of whom revel in the openness of the right to bear it all in a natural setting. Sunday afternoons brings a crowd of regulars together to drum, sing and dance. It’s quite crowded at this time so if you are in the mood for a quiet, private experience, Sunday afternoon is not the optimal time to go. However, if you are in the mood for a group gathering, visiting Kehena Beach on a Sunday afternoon will be a unique experience to remember. Kehena Beach sits unassumingly along the Red Road. There is no sign announcing its presence. A small unmaintained parking area, which the local community keeps quite clean, accommodates about 10-15 cars at most. Overflow parking is allowed along both sides of the road. If you decide to make Kehena Beach a stop on your vacation remember to respect the land and the power of the ocean. People have died there and people have learned how to live life to its fullest there. There is no “in-between”. Last year the area lost a local icon, “Uncle” Manu. As it was told to me, at one point that day he said, “Today is a good day to die.” Later, he entered the ocean and drowned. Interesting place, Kehena Beach. Visit it with abandon and play with caution. 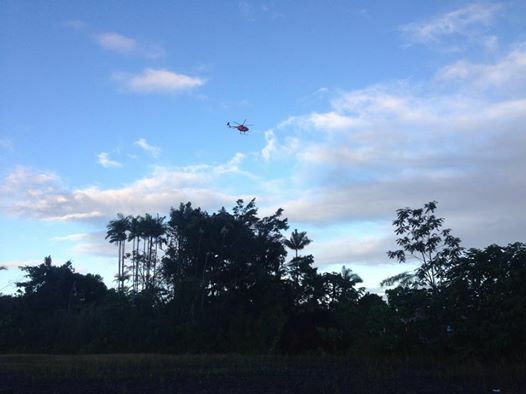 The Pahoa lava flow stalled out today creating a respite for local residents in process of evacuating the area. Officials stress that this does not mean they are out of danger as it will likely start flowing again in the near future. 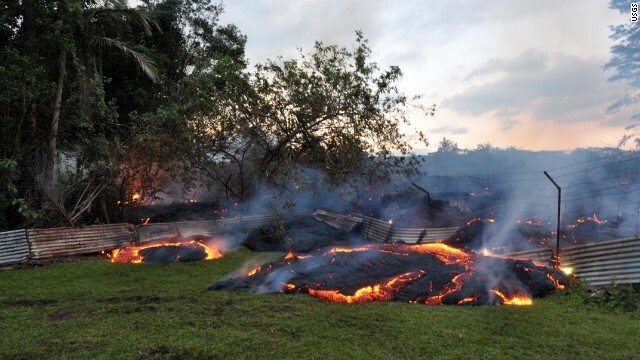 CNN: Lava burns vegetation as it approaches a property boundary early on the morning of Tuesday, October 28. A lava flow from the volcano Kilauea is advancing on the community of about 950 people on Hawaii’s Big Island. By early Tuesday, the flow was about 70 yards (64 meters) from the closest home and moving to the northeast at 8 to 11 yards (7-10 meters) per hour, the Hawaiian Volcano Observatory said. Aloha all – I’ve not been as active posting to the Daily Flow since relocating back to mainland. Given the current daily flow of the July 27th eruption into Pahoa Town, it’s time to resume posting. I lived in the Puna District and on Hawaii’s Big Island for over 5 years, and as anyone knows whether visitor or resident it’s a love affair that lasts a lifetime. It’s a love affair with the land and its people. 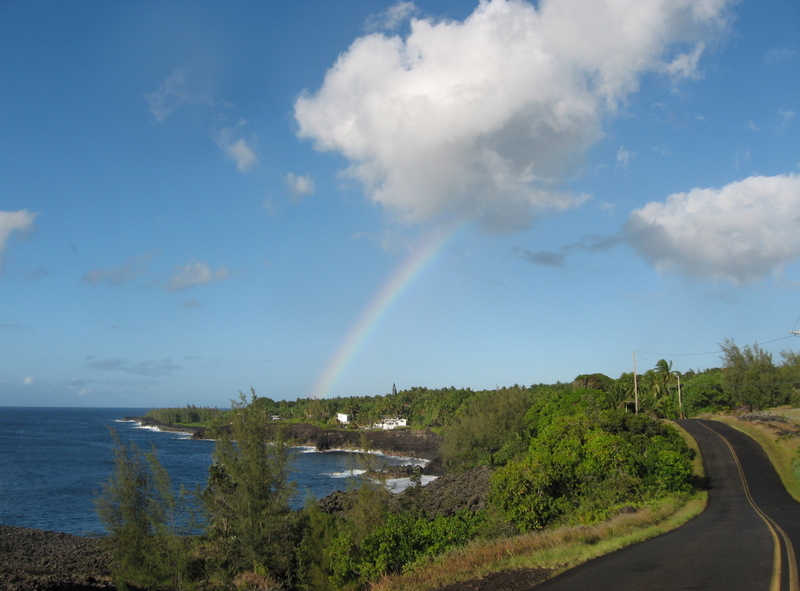 Pahoa Town was our “go to” place for gas, groceries, supplies, music, restaurants and shops. I lived in an area by the ocean where I could see the steam plume from my lanai. It flowed southwest into the ocean across the pali near Kalapana for years. Since July 27, 2014, it has been flowing in the opposite direction of northeast toward more populated areas. And now, it encroaches Pahoa Town. I will be posting articles and updating my blog regularly. I will be visiting Hawaii’s Big Island from November 6th-December 2nd and hope to be able to visit my Ohana that live in Seaview and off Red Road, but sadly if Highway 130 gets covered I may be unable to do so. Posting respectfully to those affected by the lava will be my first priority. Blessings and love to those in her path. Genevieve passed by the Hawaiian Islands today only to grow in strength and become Typhoon Fengshen. This system promises to be a force beyond reckoning. Watch this system as it grows in strength…. 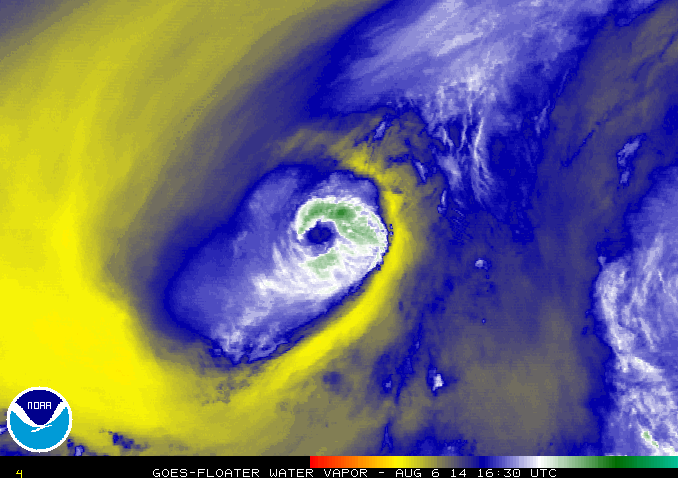 Battle between Pele (yellow, warm dry air) and Iselle (blue, moist cool air). A hurricane warning has been issued for Hawaii’s Big Island in addition to flash flood warnings throughout the islands. 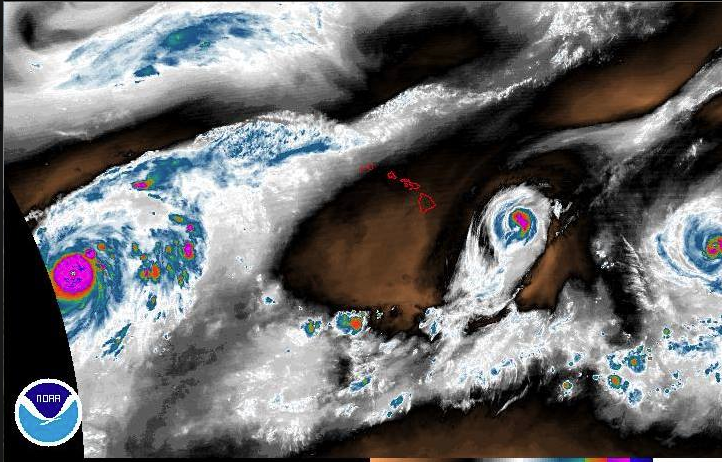 If, in fact, Iselle is a hurricane when it makes landfall on Big Island, it will be an unprecedented “first” and meteorologists aren’t sure what will happen. Check out Hurricane Julio’s 5-day forecast and batten down the hatches! 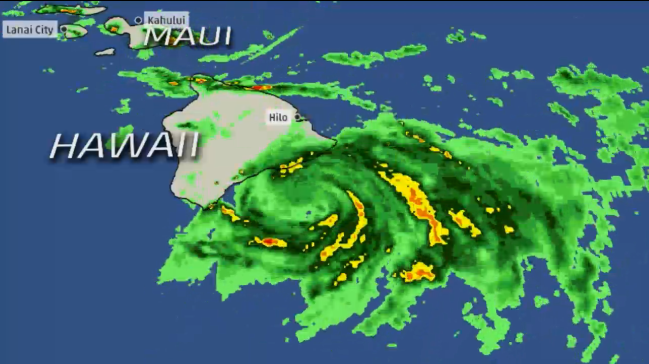 Tropical Storm Iselle is making landfall right now. It is reported that HPP (Hawaiian Paradise Park) has a lot of damage. Even though this weather system has been downgraded to a tropical storm means little with regard to heavy rain and windspeed. In addition, there are many tree species on the island that are not indigenous to the area which makes them vulnerable to wind damage. 15-25 ft. waves are being observed with up to 70 ft. high splashes! Best to stay away from the beaches and avoid coastal roads if possible. It’s recommended that you shelter in place at this point – however, here is a list of shelters for your information should you decide it is too dangerous to stay in your home because of damage. Yes, Paradise has Winter weather and this past week brought snow to Mauna Kea and Mauna Loa. 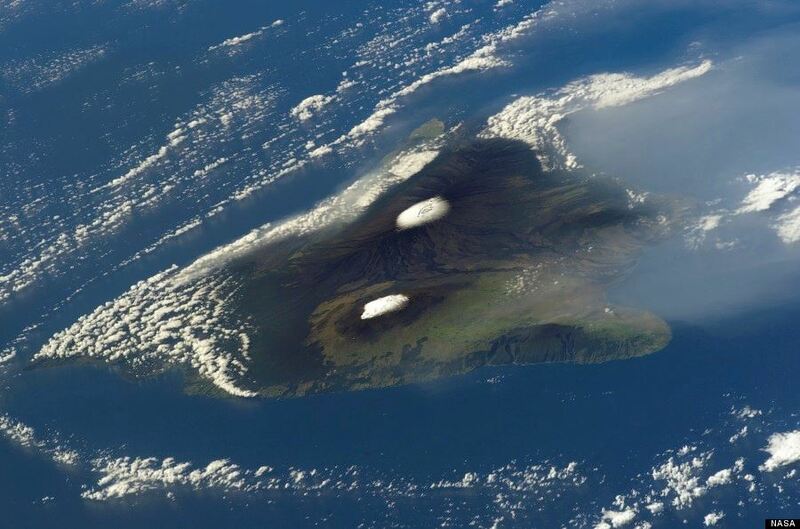 Hawaii’s Big Island from Space – Mauna Kea and Mauna Loa snow capped. 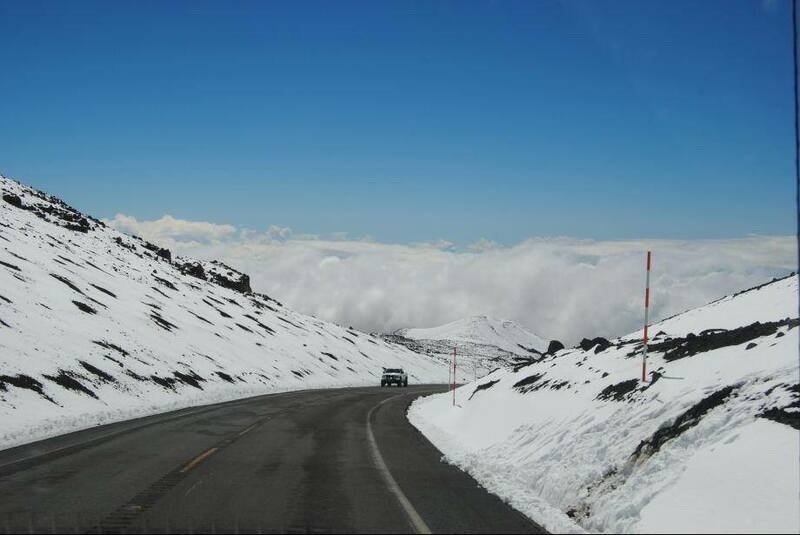 Photo of snow covered road to Mauna Kea. It’s truly an experience to be able to ski at 12,000 feet elevation and be back on the beach in about an hour. And, a spectacular sight to see the snow capped majesty of the volcanoes that formed the island. Winter’s not over yet – and freezing temps will stick around for a while. Please be mindful of the dangers of hiking the mountains. One hiker had to be rescued after being stranded for two days. Enjoy and stay safe! Meteorologists and Scientists from around the world depend upon data sent from the TAO/TRITON array of buoys in the Pacific Ocean to predict weather patterns around the world. Once 80-90 percent operational, by the end of 2013 that information has dropped to around 40 percent. This data has been used in the past to create weather models and provide early alerts likely saving both lives and money specifically with regard to El Nino events. Droughts, flooding and severe Winter weather can all be attributed to the El Nino and La Nina patterns. But why the sudden collapse? In simple terms, U.S. funding cuts and the retirement of one of the U. S. ships key to maintaining the buoys caused the rapid collapse of the array. Concerned Scientists from around the World will be meeting in San Diego next week at Scripps Institution of Oceanography to discuss what’s needed to salvage, sustain and maintain the array of buoys and hope to announce new funding sources. Funding will not likely come from the U.S. unfortunately demonstrating its priority regarding climate change and the environment and will more likely come from Asian countries such as China and South Korea, also affected by Pacific Ocean weather patterns. This Winter Season has been an incredible opportunity to catch big wave. 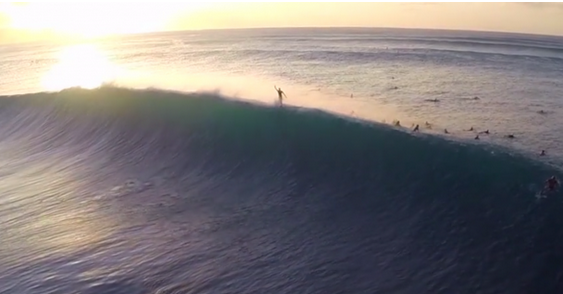 This video taken with a Drone and a GoPro is probably the best surfing video I’ve ever seen.